It finally happened. After limping on with an obsolete blogging platform for 14 years, I've finally decided to put this feed to bed and start a shiny new blog on a better, current platform. For one week only, we’re offering a veritable picnic of on-site code craft training at never-to-be repeated prices. Save up to 65%, and train your developers in key skills like TDD, refactoring and OO design for as little as £40 per person per day. That’s full, action-packed hands-on days of code craft training. Book any Codemanship training course before June 17th and save a whopping 50%. Book all four of our courses and save 65%. That’s a massive £12,000. Changes are afoot with my code craft training and coaching company, Codemanship, and as part of that, I'm making my 222-page TDD course book available to download as a spiffy full-colour PDF for free. It covers everything from the basics of Red-Green-Refactor, through software design principles to apply to your growing code, all the way up to advanced topics other TDD books and courses don't reach, like mutation testing, property-based and data-driven testing and Continuous Inspection. Many people who've read the book have commented on how straightforward and to-the-point it is. 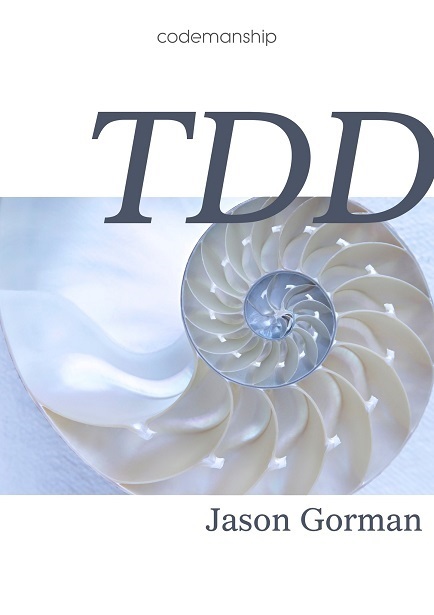 Shorter than most TDD/code craft books, but covers more, all in practical detail. Of course, to get the best from the book, you should try the exercises. Better still, try the exercises with the guy who wrote the book in the room to guide you. "You must be really busy!" is what people tend to say when I tell them what I do. It stands to reason. If software is "eating the world", then code craft skills must be highly in demand, and therefore training and coaching for developers in those skills must be selling like hotcakes. Well, you'd think so, wouldn't you? The reality, though, is that code craft is critically undervalued. The skills needed to deliver reliable, maintainable software at a sustainable pace - allowing businesses to maintain the pace of innovation - are not in high demand. We can see this both in the quality of code being produced by the majority of teams, and in where organisations focus their attentions and where they choose to invest in developing skills and capabilities. "Agile transformations" are common. Some huge organisations are attempting them on a grand scale, sending their people on high-priced training courses and drafting in hundreds of Agile coaches - mostly Scrum-certified - to assist, at great expense. Only a small minority invest in code craft at the same time, and typically they invest a fraction of the time, effort and money they budget for Agile training and coaching. The end result is software that's difficult to change, and an inability to respond to new and changing requirements. Which is kind of the whole point of Agile. IF CODE CRAFT ISN'T A SIGNIFICANT PART OF YOUR AGILE TRANSFORMATION, YOU WILL NEVER ACHIEVE AGILITY. You can't be responsive to change if your code is expensive to change. It's that simple. While you build your capability in product management, agile planning and all that scrummy agile goodness, you also need to be addressing the factors that increase the cost of changing code. Skills like unit testing, TDD, refactoring, SOLID, CI/CD are a vital part of agility. They are hard skills to crack. A 3-day Certified Code Crafter course ain't gonna cut the mustard. Developers need ongoing learning and practice, with the guidance of experienced code crafters. I was lucky enough to get that early in my career. Many other developers are not so lucky. That's why I built Codemanship; to help developers get to grips with the code-facing skills that few other training and coaching companies focus on. But, I'll level with you: even though I love what I'm doing, commercially it's a struggle. The reason so few others offer this kind of training and coaching is because there's little money it. Decision makers don't have code craft on their radars. There's been many occasions when I've thought "May as well just get Scrum-certified". I'm not going to go down without a fight, but what I really need (apart from them to cancel Brexit) is for a shift in the priorities of business who are currently investing millions on Agile transformations that are all but ignoring this crucial area. Of course, those are my problems, and I made my choices. I'm very happy doing what I'm doing. But it's indicative of a wider problem that affects us all. Getting from A to B is about more than just map reading and route planning. You need a well-oiled engine to get you there, and to get you wherever you want to go next. Too many Agile transformations end up broken down by the side of the road, unable to go anywhere.